“We game-plan together. We script together. We make sure we all know what calls are going to get called, because we’ve done it together. This isn’t about one person.” - Washington Defensive Coordinator Jimmy Lake. Last winter, one of the more unique coaching transitions you'll find in modern college football occurred inside the Dempsey Indoor facility overlooking Union Bay in Seattle. Pete Kwiatkowski, Chris Petersen's trusted defensive coordinator for seven seasons going back to their days at Boise State, offered to step aside. While many coaches give up play-calling duties in the twilight of their careers, Kwiatkowski was in his coaching prime. At 51 and coming off a season in which his unit ranked 8th nationally, his voluntary decision to hand over the unit to a subordinate was unexpected, to say the least. According to those close to the situation, it was Kwiatkowski who approached his boss about making the change, knowing that Lake, then the promising defensive backs coach, would likely land a coordinator job elsewhere. It's no surprise that Lake was sought-after, after mentoring a slew of NFL-ready defensive backs in his four seasons at UW. Four of Lake's proteges have heard their names called in the first two rounds of the NFL draft, including pro-bowler Marcus Peters. Up front, the Huskies line up two 300 lb tackles whose job is to eat up double-teams and disrupt blocking schemes. Outside of those big boys are a pair of hybrid end/linebackers who appear more like the kind of stand-up pass rushers you might find in Pittsburgh or Baltimore on Sundays. Behind those front four, however, is where the reigning Pac-12 Defensive Player of the Year resides. At just 6 feet and 220 lbs, Ben Burr-Kirven doesn't look like an old-school middle linebacker. However, it doesn't take long to notice that #25 always seems to be around the ball. The senior from Menlo Park, CA leads the nation in total tackles with 165, and it's easy to see why. Despite his slight frame, the Huskies' MIKE 'backer easily sheds blocks thanks to his excellent feet. Rarely taking false steps, Burr-Kirven seems to quickly diagnose every play and get leverage on blockers to prevent them from ever making clean contact. This allows him to quickly shed their efforts and close on the runner, always wrapping up with textbook form. This same ability to read-and-react quickly picks up misdirection plays like counters, reverses, and screens meant to send him false signals. But while Burr-Kirven may have been the traditional DPOY out west, it was his teammate in the secondary who most impressed the analysts at Pro Football Focus. Redshirt sophomore Byron Murphy (#1) received the site's top grade for any cornerback in the nation (91.9%), thanks to 13 broken-up passes, four interceptions, and an opposing passer rating of only 47.1 from his spot on the left side. A talented defender in coverage, Murphy also makes plenty of plays near the line of scrimmage and ranks fourth on the team in tackles in Lake's three-deep, pattern-match scheme. With Murphy locking down the left side on virtually every snap, versatile safety Taylor Rapp (#7) can be found lining up all over, acting as the deep centerfielder one snap, then spying the quarterback the next. The PFF All-American ranks third on the team in tackles, with a pair of interceptions and a team-leading five sacks. Despite his ability to make plays in the offense's backfield, he's still a capable defender against the pass. 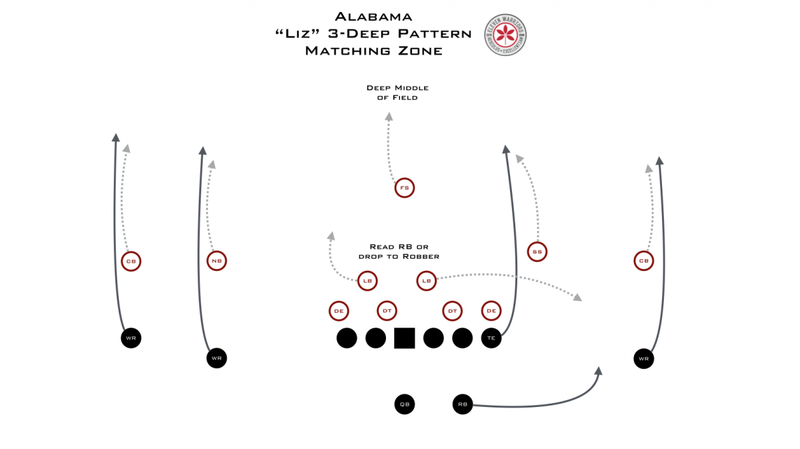 This versatility is paramount to Lake's pattern-match scheme, modeled after the one pioneered by Nick Saban known as Rip/Liz. While both safeties line up deep initially, they'll roll down to create a 'one-high' look with a safety and nickelback lined up as alley defenders. If the offense were to run all four receivers straight downfield, the defense looks just like Cover-1 man-coverage with a deep safety in the middle of the field. But if the receivers cross, the seam defenders and linebackers will trade the crossers like a traditional zone scheme, with the corners dropping into a deep 1/3 zone behind them. In addition to Rapp, the key to this scheme is nickelback Myles Bryant (#5) whose role is similar to that of the SAM outside linebacker in Ohio State's defense. Lined up wide over the slot receiver, the second-team All-Pac-12 performer is responsible for setting the edge against the run but also making plays out in space against the pass in spread formations. While he's largely been successful in this regard, tallying 55 tackles, 4.5 tackles-for-loss, and 5 passes broken up this fall, he's often a target for opposing offenses that execute run/pass options. Similarly, since Bryant is on the field for his ability to do many things well, instead of being elite in one particular area, opponents have tried to take their chances by isolating him downfield instead of Murphy. Thanks to a Fade-Smash concept that left the corner sitting on a hitch in the flat, Bryant was left chasing talented Penn State receiver DaeSean Hamilton in what became man-to-man coverage downfield in last year's Fiesta Bowl. In Lake's first year at the helm, his Huskies have proven quite difficult to throw against, ranking seventh nationally (and tied with Michigan) by allowing only 5.7 yards-per-pass-attempt. However, if there is one area in which his defense has taken a step back from the year prior, it's in their ability to rush the passer. After finishing with 39 sacks in 2017, the Huskies have only brought down opposing quarterbacks 21 times this season, ranking 97th nationally and ahead of only UCLA and Oregon State in the Pac-12. Without a pure pass-rusher capable of collapsing the pocket on his own, Lake is forced to rely on blitzes, which is why Rapp and Bryant lead the team in sacks from their positions in the secondary. However, thanks to Lake's tutelage, the Huskies would rather let the depth and talent of their secondary carry the burden rather than gamble with pressure. More often than not, Lake will drop eight defenders into coverage in passing situations, each keeping the play in front of them. This scheme has found great success against a number of high-powered offenses, including Washington State's top-ranked passing game. Thanks to some snow and a familiarity with their rival's scheme, Lake and Kwiatkowski held the Cougars to just 152 yards on 35 attempts, easily the worst performance of the season produced by Mike Leach's vaunted Air Raid offense. But the Huskies will have their hands full against Ohio State and the nation's second-best pass offense. Coming off nearly 500 yards against Northwestern's similar 3-deep zone scheme in the Big Ten title game, Dwayne Haskins has feasted off defenses looking to sit back. According to PFF, the Heisman finalist leads the nation with 40 touchdown passes from a clean pocket, proving that time is the worst thing a defense can give him. But few, if any, Buckeye opponents have featured the same level of NFL-ready talent in the secondary as the Huskies. For Ohio State to raise the Rose Bowl trophy on January 1st, they'll have to put on yet another fireworks show in the passing game, though this time it might not be as easy.